My friends know how much I love history. My friends also know how much I love a good cocktail. When I can put the two together it’s a match made in heaven. One of my favorite magazines is Imbibe, a publication dedicated to “Liquid Culture.” In addition to spirits, beer, coffee, and wine, the editors/writers/contributors always manage to find the latest hot trend in “liquid,” or what I especially love, the most obscure spirit that has some strange historical significance. This month it is Becherovka. I won’t repeat the article, but instead offer the Cliff Notes summary. 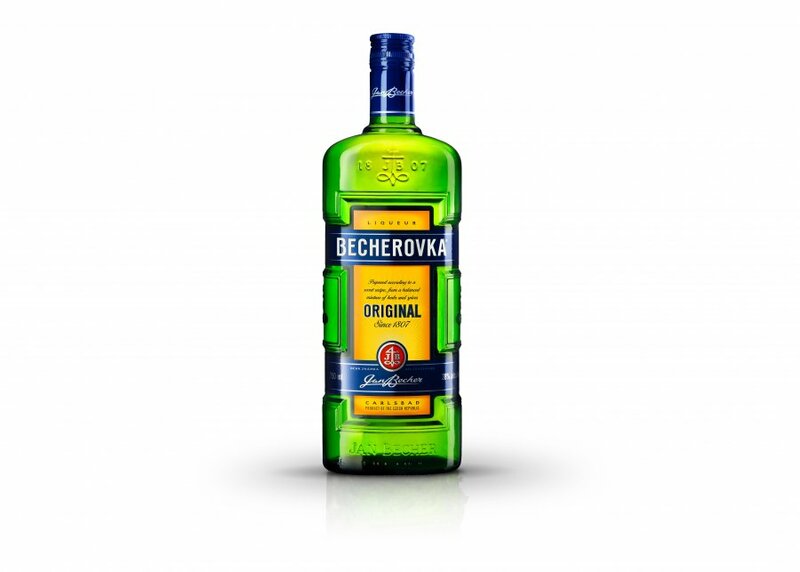 Bercherovka is a liqueur from Bohemia, or what is now called the Czech Republic, made from a blend of botanicals macerated in alcohol, sweetened and lightened with the curative waters from the city where it’s made – Karlovy Vary. The full name is Becher’s Original Karlsbader English Bitter, shortened, mercifully to Becherovka. I urge you to read the full article! What attracted me most, in addition to the weird obscurity of the spirit, is the wintry character of the cocktail recipes Imbibe presented. The one which caught my attention the most is Wakeman’s Air, the product of Rick Paulger at Michael Symon’s Roast in Detroit. I rolled one and was immediately smitten. The cocktail is warm and inviting with a seductive mix of spicy complexity supplied by the Becherovka. Perfect for a wintry evening! Combine all ingredients in a mixing glass with ice. The original recipe calls for the mixture to be stirred with ice, I prefer to shake with crushed ice, then strain into a cocktail glass. To garnish, cut a quarter-sized disk from the peel of an orange, avoiding the pith. Carefully holding a lit match in one hand above and just to the side of the glass, quickly squeeze the orange disk so the oils from the peel spray through the flame and into the drink. Discard the peel. Domaine Le Garrigon is an entirely organic wine maker in Tulette, a quaint, ancient town situated at the southernmost part of the Départment of the Drôme. The town of Tulette is delimited to the north and the south by an area known as the “Enclave of the Popes”, which is part of the Départment of the Vaucluse. This is where Grenache, Syrah and Carignan thrive, producing eminently quaffable, sun-drenched wines. The winery itself was founded in 1919 by the grandfather of current owner, Daniel Couston. Along with his sister, Marie-Francoise, the winery has developed a range of fruity, terrior-driven wines that are classic Rhône valley charmers. The property spreads over approximately 200 acres from Tulette to Visan and sits upon calcareous clay and calcareous silt subsoil, with plenty of the stony, pebbly topsoil that is the hallmark of the Rhône. They produce AOC Côtes du Rhône as well as Côtes du Rhône Villages wines. Since 1997 the winery has been using entirely organic practices throughout the vineyard and production facility. No chemicals, enzymes or other non-natural products are used on the property. The first thing that caught my eye was the packaging. 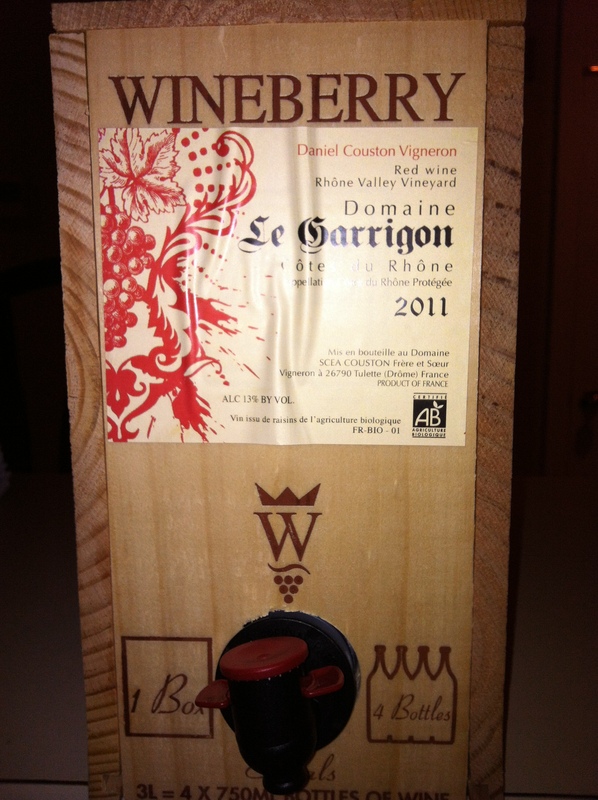 The wine is sold in a wooden wine box, evoking the image of a miniaturized wine case box. Within the wooden box is a vacuum-sealed 3 liter bladder with a spigot for dispensing. Like most box wines, as you dispense the wine the bladder deflates behind the remaining wine to limit oxygenation and spoilage. I had the box on our counter for about nine days and the wine was as fresh on day nine as it was on day one. The wine itself is a blend of 60% Grenache, 10% Syrah, 30% Carignan grapes, grown on vines with between 15 and 45 years of age. The soil is worked mechanically to avoid the use of weed killers and chemicals. Upon maturation, the grapes are harvested quickly and taken through a “traditional” wine making process. The grapes are de-stemmed and crushed and placed in cement tanks for three weeks where the must is pumped over daily. Fermentation is natural using only wild yeasts. When the fermentation is complete and the wine matures, after about 10 months, pneumatic presses move the wine to the wine box bladders. The wines do not see any time in oak, which only enhances the terrior. At approximately $40 per box before any discount, you are basically buying a $10 CDR in an easy to use dispenser for every day pleasure. Factor in that the wine is an easy-drinking wine with nice Rhône character and I think you have a hit! Soft, fruity nose with cherry, red currant and lavender hints. Medium-bodied with moderate acidity and supple tannin – good balance. Cherry fruit palate with violets, tar and dried fruit notes. Moderate length – simple and smooth – highly quaffable. Drinking well now – not for aging. Very good value! I was quite pleased with the 2009 vintage in the Rhone, and frankly in most of Europe… The wines were universally lush, mouth-filling beauties with smooth, well-integrated tannins. Drink now, or in some cases, lay down for a little while to invoke more subtle flavors and aromas. The 2010 vintage provides a great example of just how variable factors in grape growing and wine making can change the profile of wines, especially those from Europe. In the Rhone, the wines are denser, darker, more closed with much more structure, almost angular, seemingly edgier. My experience thus far is that with many of the wines, there is enough fruit in the core to allow for considerable aging. This bodes well for folks like me who like to buy several bottles, if not a case to stow away for more timely consumption. 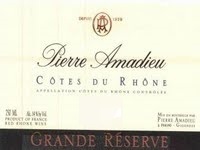 I tasted a range of 2009 Pierre Amadieu wines at a trade tasting and was smitten with the Grande Réserve. The wine was massive with an incredibly rich palate and enough stuffing to allow it to evolve with sometime in the bottle. I was excited about the price point, about $18 per bottle before the discount so I asked one of my favorite wine shops to order me a case. Bad news initially… the 2009 may not be available… Fortunately for me, a case of the 2009 was found and brought in… or so I thought. In the process of taking the wine from will call, the box broke open and two bottles crashed to the floor, breaking… Upon closer examination, it was revealed that the wine was actually the 2010, despite the box being labeled 2009. Decision time… do I take the 2010 pro-rated for breakage, or, roll the dice and hope that an actual case of 2009 would materialize. I opted for the former – take the 2010 and see how it fairs. The 2010 vintage is very consistent with the overall vintage profile – more structure, denser mid-palate although closed with edgier acidity. Much better aging potential than the 2009. Overall, while I fell in love with the 2009, the 2010 is an erstwhile companion who will likely age more gracefully and evolve more beautifully with time. Earthy nose – minerally with cherry, tobacco and garrigue hints. Medium-bodied with moderate acidity and firm, dry tannin – Good balance. Bright cherry fruit on the palate with tart red berry and dried herb notes. Moderate length with a tight, well-structured finish and cedar and allspice on the aftertaste. Needs time – should improve with another 5 to 7 years in bottle. Good value.